The U.S. 3rd Circuit covers Pennsylvania, New Jersey, Delaware, and the U.S. Virgin Islands (photo by uscourts.gov). The United States 3rd Circuit Court of Appeals recently made a ruling on an officer’s use of deadly force against a person suffering a mental disorder. The outcome of this case is extremely important for law enforcement officers not only in the U.S. 3rd Circuit, but across the nation. The U.S. 3rd Circuit has jurisdiction over Pennsylvania, New Jersey, Delaware, and the U.S. Virgin Islands. Though the decision is binding only in the U.S. 3rd Circuit, the other U.S. Circuits often look to each other’s rulings in determining similar cases. For that reason, this decision should be noted by all. Johnson v. City of Philadelphia involves a City of Philadelphia police officer responding to a call about a naked man running around in the middle of the street while chanting and confronting motorists. Sound familiar? Anytime I hear a call about a naked person acting strange my warning senses immediately kick in. I begin thinking of PCP use, overdose of methamphetamine, or some other form of drug abuse. Add in the likelihood of previous mental health concerns, and this call is a nightmare. This is the reality of the street, bloody and violent. 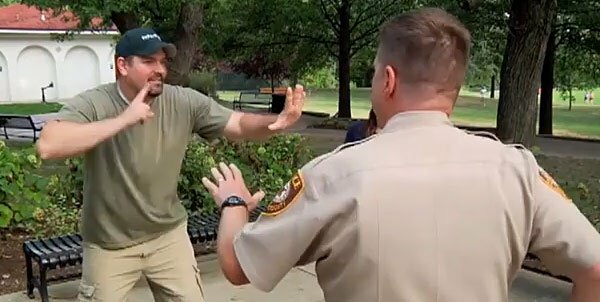 In situations like this an officer has very limited options to maintain order and protect themselves and others (photo from YouTube). One of the worst calls imaginable to all police officers is dealing with a hostile person who is mentally ill. There really is very little room for a positive outcome, and most likely the officers will be judged negatively from both directions. On one side the community will demand fast action to stop the violent lunatic from disturbing the peace or causing people harm. On the other side will be the family, mental health professionals, and legal pundits demanding the officers to slow down, try to talk it out, keep their distance, and somehow find the miracle that will turn the crisis into a cake walk. This simply isn’t reality. In many cases the officers have no background information about the deranged individual and simply have to act and react to what they are confronted with at that time. In addition, there are still way too many officers who have not been sufficiently trained on dealing with people in crisis – the buzz word for those suffering mental health problems or disorders. This must change. It doesn’t matter if you work for a major metropolitan department or a rural Sheriff’s department, it is a well-known fact law enforcement will come into contact with the mentally ill. It is just as imperative to train for these encounters as for armed felons. The Memphis Model for Crisis Intervention has been around for over 20 years. It came about because of a string of deadly encounters between Memphis, TN police and mentally ill citizens. The Model was the partnership between law enforcement, medical professionals, and psychiatric professionals, and has become one of the leading models for police interaction with people in crisis worldwide. Even though many major U.S. police departments have adopted the Memphis Model, the distribution of its critical training information still remains limited. This is a recipe for disaster. 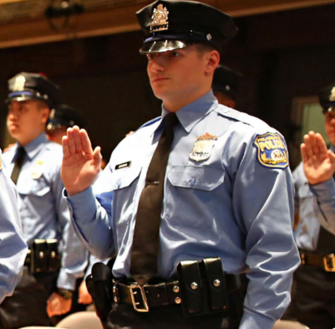 Philadelphia Police have served since 1797 (photo by Philadelphia Police). EDITOR’S NOTE: The BlueSheepDog Crew are dedicated law enforcement professionals who established this website to be a forum of training, discussion, and important product development for those who carry the shield. With both active and retired law enforcement officers on staff, we have over 60 years of experience. However, we are not attorneys at law. Our Legal Issues articles are presented here for informational and discussion purposes only. We encourage our readers to remain at the forefront of changing legal doctrines, but we must caution that nothing in this article should be considered “legal advice.” Readers are directed to contact their department legal advisor or Prosecuting Attorney for proper legal instruction in their jurisdiction. During the early morning hours of April 22, 2012, Officer Thomas Dempsey of the City of Philadelphia Police Department was assigned to a single officer patrol car in North Philadelphia. His duty gear weapons included a baton, a Taser, and a 9mm Glock handgun (likely the Glock 17, but there are several allowed options for Philly cops). Around 0200 hours, Officer Dempsey was dispatched to a naked man was standing in the street in the 5800 block of North Mascher Street. Dempsey and two other patrol officers responded to the call, but were unable to locate the subject. Around 0530 hours, Officer Dempsey responded to another call about a naked man on the same block, but again was unable to locate the subject. At approximately 0600 hours, a passing motorist informed Dempsey that a naked man was in the street at the corner of North Mascher and Nedro Avenue. Officer Dempsey his Dispatch and then drove down North Mascher to the intersection. Upon arrival, Officer Dempsey observed a naked man, later identified as Kenyado Newsuan, standing in front of a residence at 5834 North Mascher. Accounts diverge as to what happened next, but the record contains testimony from (4) eyewitnesses: Officer Dempsey, Juan Cruz, Raimundo Rivera, and Newsuan’s girlfriend, Christina La Torre. EDITOR’S NOTE: A “reasonable officer” must consider this is the 3rd call for service on this man, and his obvious unstable condition (naked in the middle of the road) is a clear indication of a mentally unbalanced person. In addition, a “reasonable officer” must recognize in a very short time, that a person, such as Newsuan, who is now walking towards a residence, may be a legitimate and imminent threat to anyone he encounters. Mental health professionals may not agree, but an officer’s duty is first and foremost to protect the innocent. Newsuan is a #4 (suspect/subject) on the Priority of Life scale, while any residents are either a #1 (hostage/victim), or a #2 (innocent bystander). Officer Dempsey is a #3 (police/first responder) and has a duty to intervene on behalf of the #1’s and #2’s. Considering Newsuan’s move towards residences this call’s threat level has increased significantly, and the options for Officer Dempsey to safely carry out his duty have unfortunately decreased significantly. The understanding and application of the Priority of Life scale in no means disregards an officer’s duty to the Sanctity of Life. In other words, officers are sworn to preserve everyone’s life unto the most extreme of circumstances. However, when life-threatening circumstances are confronted, the Priority of Life scale is society’s scale of whose lives are more important to save. The Philadelphia Police are one of our nation’s oldest police forces (photo by Philadelphia PD). According to Officer Dempsey when he arrived at the reported intersection he observed Newsuan naked in the middle of the street. He estimated Newsuan to be 6.0″ and 220 pounds. When he came to a stop, Newsuan began walking towards a house (later determined to be his girlfriend La Torre’s residence). As the situation was unfolding rapidly Officer Dempsey exited his patrol car, but did not notify Dispatch of his situation. Officer Dempsey testified he approached Newsuan with his Taser in his hand, while telling Newsuan “come here.” Newsuan responded with screaming profanities and “flailing his arms around”. 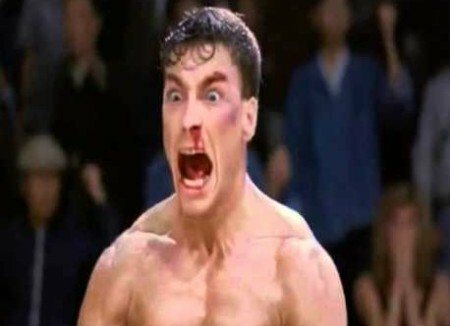 Due to Newsuan being completely naked Officer Dempsey could see he was unarmed. Dempsey ordered Newsuan to come to him several more times with negative results. Newsuan continued to walk away and even entered the house for a few seconds. Newsuan then came back outside, unarmed, but charged Officer Dempsey in a full run while yelling at him. Officer Dempsey testified he gave Newsuan two commands to “stop,” but Newsuan continued his aggressive approach. When Newsuan was about five feet from Officer Dempsey, the Taser was deployed into Newsuan’s chest. Instead of the anticipated incapacitation, Newsuan was able to grab Officer Dempsey and a violent struggle ensued. After grabbing Officer Dempsey, Newsuan struck the officer several times in the head, and then physically threw the officer against two parked vehicles. During this struggle Officer Dempsey testified Newsuan attempted to grab his sidearm. The officer was able to counter this attempt, draw his Glock and wedge it between his body and Newsuan’s body. Fearing for his life, Officer Dempsey fired two shots into Newsuan’s chest. Newsuan, however, continued to fight and again attempted to grab the officer’s pistol resulting in one more shot from Dempsey into Newsuan’s chest. The fight was not over however, as Newsuan again attempted to gain control over the pistol, resulting in a 4th shot to his chest from Officer Dempsey. Finally, after four extremely close shots to the chest, Newsuan fell to the ground and died. At this time, Officer Dempsey testified that Newsuan’s girlfriend came to the front door screaming and crying. In his recollection of events, this was the first time she had been present. Officer Dempsey was transported to a hospital and treated for non-life-threatening injuries, and was released that night. From Officer Dempsey’s account of the event, this appears to be a near textbook attempt to confront and control a mentally ill subject, who may have presented an imminent threat to the occupants of the house he entered. Although there is room for a few suggestions. Some control techniques may look harsh, but be perfectly reasonable once professionally explained (photo from Pintrest). Whenever an officer is involved in a deadly force situation I feel it is every officer’s duty to evaluate the circumstances, place themselves in that officer’s boots, and consider that actions and alternatives. We never want to come across as critical to an officer, but we should not shy away from a critical analysis of tactics and techniques. Except for the most immediate and extreme situations, officers should notify Dispatch of their location and status (confronting Newsuan). From the record, it does not appear Newsuan was so close to the officer’s patrol car to necessitate such an immediate action that would have prevented this radio call. The radio is not just a means of dispatching calls, it is a life line that allows all your backup to know where to go to help you. Radio your position! Know your subject, and know yourself (Sun Tsu, Art of War), so that you may master the situation at hand. Here, a 1-on-1 confrontation with a large mentally unstable person is not ideal, but considering the threat to others, necessary. Therefore use all the tools at hand (see #1), while understanding their limitations (Taser at 5 feet). Approach close enough to demand Newsuan’s attention, and divert him from potential innocents, but keep enough distance to provide time and better decision-making ability. In addition, use your tools to their fullest potential – deploy Taser 10-15 feet away, use baton in closer ranges, move and use parked cars as a barrier. Time + Distance = Safer and Better Decision Making! At around 0540 hours, Cruz heard a commotion between two people on the street he lives. When he looked out his window he saw Officer Dempsey and Newsuan standing approximately 8 feet apart and “screaming at each other.” Cruz testified Newsuan “was approaching” Officer Dempsey. Dempsey deployed his taser when Newsuan was “about four feet” away. Cruz testified, Newsuan “stopped, stuttered a little bit,” after being struck with the Taser, but then “just rushed” Officer Dempsey. He testified Newsuan lifted Officer Dempsey up by his duty belt, began “beating” Dempsey and “slamming” him onto the hood of the squad car, and then pushed Dempsey against a parked vehicle. At that point Cruz stated, “it looked like [Newsuan] was going for” Dempsey’s gun, and Cruz heard a series of gunshots before Newsuan fell to the ground. Grabbing an officers firearm suggests intent to kill (photo from YouTube). Like Cruz, Rivera also lived on North Mascher, and heard yelling outside his apartment in the early morning hours. He thought he heard something like a car door slamming, and a man yelling, “I’m Jehovah. The end is near.” Rivera then heard (but did not see) someone being Tased. According to Rivera, he did not hear “any statements or yelling or anything immediately preceding the Taser,” and he never heard Dempsey issue any commands to stop or get down on the ground. Rivera got up and went to the window, where he saw Newsuan “completely naked, rushing over to the police officer.” Newsuan then slammed “the officer against his patrol car and grab[bed] him by the neck and start[ed] pummeling his head against the car.” Rivera testified Newsuan “reach[ed] for” Officer Dempsey’s gun. While Newsuan “had him by the neck,” Dempsey unholstered the gun and shot Newsuan three times at close range, causing Newsuan to fall to the ground. La Torre testified on the night of April 21, Newsuan showed up at her house high on PCP and acting paranoid. Over the course of the night, Newsuan became progressively more agitated, running out of the house and into the street several times and yelling nonsensical phrases. Sometime around sunrise, Newsuan removed his clothes and walked back onto North Mascher. La Torre said she told Dempsey, “he’s on PCP” and Newsuan needed to be involuntarily committed to a mental health facility. Officer Dempsey told her, “don’t worry about it, everything is under control.” The officer also instructed her not to let Newsuan into the house because there might be weapons inside. As Officer Dempsey began walking from the street toward the house he told Newsuan, “hey you, come here.” La Torre claimed Newsuan “didn’t say anything” but just “star[ed] at” Dempsey. Officer Dempsey walked up the path to the house and repeated the command for Newsuan to come to him. According to La Torre, Newsuan “just look[ed] at” her. Officer Dempsey backed up, stepped down onto the pavement, and asked Newsuan if he could hear him. Newsuan “started walking” toward Officer Dempsey. According to La Torre, this is when Officer Dempsey deployed his Taser at Newsuan. La Torre claimed Newsuan was not running at Dempsey, but rather “walking in response to the officer telling him to come here.” After being Tased, Newsuan’s “body started convulging [sic], like shaking.” Newsuan reached up and pulled the Taser prongs from his body. Officer Dempsey responded by drawing his gun and began backing away from Newsuan. Newsuan was “just staring” at Dempsey. La Torre claimed she ran back into the house, grabbed her phone, and began calling Newsuan’s mother and brother. Through the window, she could see Officer Dempsey with his gun still drawn, but could not see Newsuan. La Torre became frightened and ran into her bedroom, so she did not see the physical altercation between Officer Dempsey and Newsuan. While in the bedroom, she heard four gunshots in rapid succession, and went back out to the street where she saw Newsuan lying in the street. Newsuan died shortly thereafter. La Torre’s testimony has to be considered in light of her relationship with Newsuan. However, every officer must understand that when force is used, and the family/friends of the person having force used against them are present, their testimony will likely be highly skewed in favor of the suspect (think Ferguson, MO PD Officer Darren Wilson and Michael Brown). The critical facts of that deadly encounter only became conclusive after an exhaustive, and timely, forensic analysis. During that time Officer Wilson went through hell! Johnson, as Administratrix of Newsuan’s estate, sued the city and officer for violating Newsuan’s 4th Amendment right to be free from excessive force (42 USC 1983). The City and the officer filed motions for summary judgment and the U.S. District Court granted the motion, dismissing the suit in favor of the City and officer. Johnson appealed the District Court’s grant of summary judgment to the U.S. 3rd Circuit Court of Appeals. 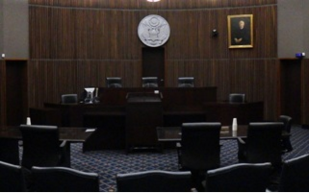 A courtroom of the U.S. 3rd Circuit Court of Appeals (photo by uscourts.gov). During the appeal, Johnson argued that the shooting was unreasonable under the 4th Amendment because Dempsey unnecessarily, and in violation of department policy, initiated a 1-on-1 confrontation with Newsuan leading to the subsequent fatal shooting. deadly force is necessary to prevent the suspect’s escape or serious injury to others. In Scott v. Harris, however, the Supreme Court clarified that “Garner did not establish a magical on/off switch that triggers rigid preconditions whenever an officer’s actions constitute ‘deadly force. '” Rather, Garner was “simply an application of the Fourth Amendment’s ‘reasonableness’ test to the use of a particular type of force in a particular situation.” Scott abrogates our use of special standards in deadly force cases and reinstates “reasonableness” as the ultimate—and only—inquiry. Appropriate use of force will be determined on the reasonableness in each particular case (photo by U.S. Mint Police). “Whether or not [an officer’s] actions constituted application of ‘deadly force,’ all that matters is whether [the officer’s] actions were reasonable.” The considerations enumerated in Garner are not irrelevant to the reasonableness analysis. In many cases, including this one, a proper assessment of the threat of injury or the risk of flight is crucial to identifying the magnitude of the governmental interests at stake. But those considerations are simply the means by which we approach the ultimate inquiry, not constitutional requirements in their own right. 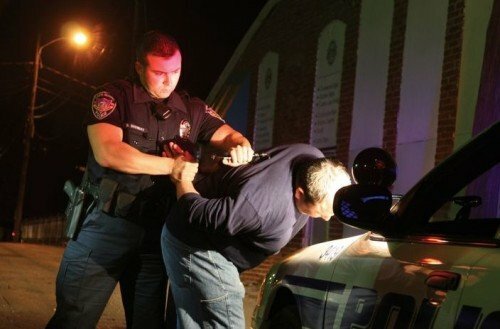 Taking mentally ill subject’s into custody is one the most dangerous physical and legal activities an officer performs. The Court went on to note their use of force analysis involves the “totality of the circumstances” that includes the conduct leading up to the shooting. Plaintiff agreed Officer Dempsey was justified in using deadly force when he was attacked and Newsuan attempted to grab his gun, however, the officer’s conduct in initiating the 1-on-1 encounter with Newsuan was unreasonable. This claim was made because Philadelphia Police Department policy instructs officers who encounter severely mentally disabled persons or persons in drug-induced psychosis to wait for back-up. The policy also instructs officers encountering this type of person to attempt to de-escalate with conversation and to even retreat rather that using force against such person. Plaintiff argued Officer Dempsey knew or should have known that Newsuan was mentally disabled, because Newsuan was naked, unarmed, and the officer had responded to two prior calls in the area that did not involve Newsuan being violent or threatening. Therefore, based on this fact, the plaintiff alleged on appeal that it was unreasonable for Officer Dempsey to violate department policy (back-up, de-escalation, and retreat) and initiate the 1-on-1 encounter with Newsuan. Thus, the 3rd Circuit considered as part of the reasonableness analysis, whether an officers reckless or deliberate conduct unreasonably created a need to use deadly force. The culpability of the civilian’s intervening acts. The Court then noted, as a matter of law, Newsuan’s own acts of violently attacking Officer Dempsey and ultimately trying to grab his gun were the cause of his death, rather than the officer’s initiation of a 1-on-1 encounter in possible violation of Department policy. The question of proximate causation in this case is made straightforward by the exceptional circumstances presented—namely, a sudden, unexpected attack that instantly forced the officer into a defensive fight for his life. As discussed above, that rupture in the chain of events, coupled with the extraordinary violence of Newsuan’s assault, makes the 4th Amendment reasonableness analysis similarly straightforward. In other words, use of force cases are very fact-specific, and every case may not have the same result as this case did based on the facts of this very violent assault on the officer. This decision makes clear that it cannot “be assumed that mentally disturbed persons are so inherently unpredictable that their reactions will always sever the chain of causation.” This wording would seem to imply, for example, that if the officer had information that a person was armed and violent, and then chose to initiate a one-on-one encounter, the result might have been different. As such, the 3rd Circuit Court of Appeals affirmed the District Court’s grant of summary judgment to Officer Dempsey and the City, relieving them from civil penalty in Newsuan’s death. The decision to use deadly force is usually not as clear as this! Officer Dempsey’s experience is one of the worst an officer can face, and in the eyes of the U.S. 3rd Circuit were “extreme“. It was those extreme circumstances that enabled to Court to rather easily determined it was Newsuan’s own actions that caused his death. However, the Court issued a strong warning about using this case to create a blanket procedure or justification for use of force (especially deadly force) in all encounters with the mentally ill.
Officers must take into account all of the facts, circumstances, and observations of each individual situation, and then make sound decisions based upon those criteria. Rushing into a situation without proper forethought will likely subject the officer to civil remedies. For that reason, it is imperative that officers remain “students for life,” and stay up-to-date on their skills, physical fitness, and legal parameters for their use of force against citizens. Failure to do so is like signing the check for a huge civil penalty. Prior knowledge of the officer for that particular subject. Known or suspected mental illnesses and their associated behaviors. Have a firm understanding of the Priority of Life and the Sanctity of Life. Recognize the signs of a person in distress or crisis (drug induced, or illness). When practical, use calm verbal commands and reassurance of help. Maintain appropriate distances to provide safety and better decision-making. 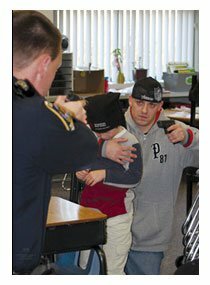 Evaluate the available tools (Taser, baton, etc. ), and use them appropriately. Don’t rush in, unless the dangers to others require it. Consider outside resources (Mental Health Hotlines, subject’s doctor, etc.). Use appropriate force only when the situation absolutely requires it. Confronting the mentally ill has been, is, and will likely always be something a police officer will be expected to perform. Proper training and recognition of people in crisis, along with enhanced verbal de-escalation tools, and less lethal weapons, can and has been proven to be very effective. Society recognizes the mentally ill don’t always understand their actions, even when they are threatening. Though society, and the Courts, have been understanding of officers using force (even deadly force) against persons suffering with mental illness, they have also been consistently very critical in their analysis of whether that force was justified and necessary. The mentally ill are viewed more as victims, than suspects, and a wise officer will acknowledge that in their actions. Great presentation and excellent analysis. There was only on obvious fact left out. And that fact is that the officer was alone. Police can go a long way in resolving this problem by demanding that Police and EMS UNIONS require that on third shift, in urban communities, that officers are NEVER alone in their police cars. Having two capable officers in every squad car insures that you have 1) more options, 2) more time to make critical life threatening decisions that must usually be made in tenths of seconds. Almost all of the problems in terms of criticism and increased scrutiny are as a direct result of departments attempting to save money by spreading their officers too thin. Too many mentally ill citizens have been killed by Police officers that were cutting corners. You cannot blame cops for this. They are doing the best jobs they possibly can with limited resources. However, the public is sick and tired of the constant excuses and shifting of blame. They aren’t going to take it anymore. And while we cannot blame individual police officers for defending themselves, we can blame their supervisory personnel, their unions and their political leaders for failing to deal with the obvious. And at some point, individual officers have to take personal control and demand that they be given the tools to deal with these pernicious issues in a safe and competent manner that gives them security and allows the mentally ill to get the professional help they sorely need. So, what action have YOU taken in your own community to improve the level of police training and staffing? Instead of shifting the blame to the officers to “take personal control” and demand that more officers be employed (or whatever your solution may be,) what are YOU doing to exercise influence and control in YOUR government. If you espouse the notion of government being of, by and for the people, then you must accept the responsibility to become involved. That means (1) understanding what the problems are through research and experience and (2) becoming involved in city council meetings/county commission meetings and having sit downs with your local elected leaders. If YOU fail to get involved, then why would your elected representatives make any move to change anything? It’s easy to sit behind a keyboard and demand others take action. It is another thing entirely to actually get involved. Well in my case, I got out. I’ve lived outside of NYC, grew up in the slums of Chicago, and spent 11 years in LA. Most citizens vote with their feet. I don’t think that I would have to go far to come up with a whole host situations in which cops have stonewalled and resisted change. Especially when it comes to their Unions. I have gone to city council meetings and have had dialogue with cops. It never did any good. Cops are very resistant, but slowly and steadily, we are seeing major changes. That is a good thing, but it is very slow in coming. Odie you make some good points, but your idealistic approach clearly indicates a lack of experience in police work. I don’t say that as an insult, but simply pointing out the fact a conclusion cannot be accurately made without fully understanding the realities of the topic. This officer was in Philadelphia, and back-up officers were available. Though he may not have been in a 2-officer car (most large cities do not patrol this way), back-up officers were available. As noted, this was at the end of a midnight shift and so it is quite possible he was hoping to put this call to rest quickly so he could go off shift – he didn’t radio his contact allowing other officers to be dispatched. Prior to that, each time the call was investigated the subject was not located. Simply demanding that all midnight shift officers ride 2-man fails to understand the realities of American policing. Our cities our spread out. My city is 70 square miles, and were happy if we have 10 officers on duty. Each rides solo, meaning they are responsible for roughly 7 square miles. If we doubled them up, that’s 14 square miles per car! You cannot effectively patrol that area and perform anything resembling preventative patrol. In my city doubling up the cars would mean each 2-man car would be responsible for about 20,000 citizens. Not only would we simply be responding call-to-call, but our response times would be greatly increased. Our citizens would not tolerate that. In regards to handling mentally ill subjects you are correct – too many officers and departments do not spend enough time and energy training officers on these interactions. Thankfully, the Memphis CIT model has been in action for nearly 20 years, and has spread broadly across the U.S. More and more officers and departments are getting the proper training, so there is hope for better outcomes. Unfortunately, all the training in the world cannot change the one variable out of our control – the mentally ill subject. Just like in this case, the actions of the subject required that force be used (in this case deadly force). Considering the ferocity of the violent attack I’m not sure if even 2 officers on scene would have resulted in a different outcome. You bring up some great points as well. I’m aware of the financial issue. However, you don’t have to have two officers for your entire area. New York City, for example, prior to this current administration would target “hot zones” in which there was significant crime and increase surveillance in these high crime areas. In those areas, Having two cops in the car would be viable and legitimate. If you “citizens would not tolerate that, ” they are more than welcome to keep doing the same thing over and over again and expecting different results. Odie we have actually done this, and also created a Crime Reduction Team to focus 2-officer cars in hot areas. It works, until it doesn’t. What I mean is both concepts do very well, until the call load simply overwhelms the plan. When you have multiple calls in the same area, and the 2-officer cars are busy, you fall right back to square one with 1-officer cars responding from different areas and arriving at different times.